During a recent overseas business trip I read about an experiment to choose six clothing items and only use those items for a month. You could have multiple copies of each item, even a different colour counted as a separate item but underwear, sleepwear, shoes and jackets etc did not count. I looked at my standard travel wardrobe, and found two pairs of Columbia pants, four sweat-wicking golf shirts (three colours) and two pairs of shorts. Five items to which I could add a more formal shirt for those dressier occasions, and still meet the Six Items or Less challenge. I lived with these five items for three weeks, and as you read this I am using them again for a month in Italy. No one ever comments on my limited wardrobe, and my daily choices are limited to picking the colour of my shirt for the day. Could I live like this for longer periods, or is six items too few to cover every contingency? I decided that with some minor modifications, the experiment could be applied to my every day life and significantly reduce the size of my wardrobe. The first adaptation was to allow different colours of the same items so my four golf shirts would become one item. I also allowed myself some latitude items that get regular use in rotation with other similar items. 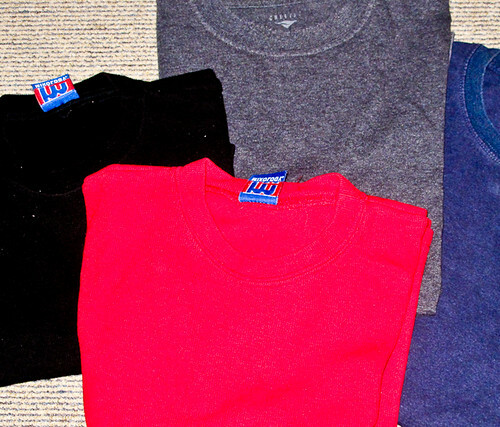 For example, I had many long-sleeve shirts of different brands from which I selected the ones I use regularly and counted them as one item. As these items wear out I will look at following my plan to find an item I like that will replace all the differing brands. Using these adaptations, I have reduced my wardrobe to seven items plus work uniforms that are supplied and required by my employer. I feel liberated from the fashion cycle, and yet have retained the best of my clothes while ridding myself of clothes that are functional but never made it into my rotation. For most of us, we keep returning to the same old favourites until they fall apart, so why clutter our closets with clothes that are never going to be worn? With a smaller clothing footprint, the clothes are not jammed into the hanging space, come off the hanger ready to wear and I can see my entire wardrobe in one place. The Six Items or Less challenge looks daunting at first but a worthwhile experiment for anyone seeking to simplify their life. The original experimenters had a variety of experiences, and you can read their stories here. Now it is your turn. I have cut back my wardrobe drastically as I began to realize that you can only wear one blouse/shirt or skirt or pair of slacks/shorts at a time. I have also learned that you can wear an item more than once before washing it in many cases. Since I no longer work and due to disability stay home many days, I have found that I can get by with a pair of capris or slacksm and a couple of blouses to wear when I leave the house, a couple of blouses I rotate and a pair of slacks for church, and a couple of outfits for around the house. I have one nice dress in case I need to wear one to something. It’s very freeing to have so little to take care of and so little in my closet. I saved everything for years and years, clothes that fit my thin cycles, my medium cycles, and my fat cycles. Finally got my weight to stay in the medium cycle for what I hope is forever and ever, and got rid of 2/3 of my wardrobe. Now I can face downsizing it even more. I basically live in jeans and linen drawstring pants with simple t’s or linen overshirts in the summer, and the same jeans plus skinny ones to tuck into boots and t’s and sweaters in the winter. Skirts or dresses are rare. It should be a snap to get down to only a few things now. I just bought 4 new work shirts today at great prices but I am taking 4 shirts that I currently have in my closet and giving them to goodwill. I like this method because it keeps the amount of clothes I own to relatively the same number while my wardrobe styles are able to keep fresh. It’s good to read that the 6 items of less trip is working well. It sounds like one of those things that might be fun to try out at least once and see how things go. The item to go can be sold, given to goodwill or end up in the bin. Helps keep a cap on our ‘stuff’ ! Do you know about Project 333 created by Courtney at bemorewithless? She’s planning to wear 33 items (including jackets/hats/gloves and jewelry but not including underwear) for 3 months–Oct 1-Dec 31–and inviting others to do it too. Good job on limiting your wardrobe, Colleen’s hubby! I really like not having a huge wardrobe of mish mash clothing. Wide leg jeans, skinny black pants, some long sleeve tees and tunics with leggings and a couple of cardigans will be my fall/winter wardrobe. Awesome post! I pared my wardrobe down a long time ago as I realized I was only wearing a handful of clothes over and over again. Like Deb J above I work at home due to disabilities and my needs are minimal. I have only a few blouses and jeans,with one dressy top and pants. It has been very liberating to have only a few items in my closet as it only takes me a few moments to get dressed. Great post, Colleen’s husband. I read it out loud to my husband, who has by far more clothes than anyone else in our family. The vast majority are t-shirts. Last time he culled them, he got rid of 10 and still had 60. Anyway, I hoped that, since he’s on board with decluttering, this might inspire him, especially as it ws written by a man. It did inspire someone, but not him! My 10 year old daughter was listening, too. She said, “I have a lot of clothes in my closet I don’t wear,” and within 10 minutes, she had culled and gottten the OK from me to rid of 17 items. One became a rag, five went to the hand-me-down box for her sister, and the others went into the thrift store box. I wore a uniform all thru school and actually loved it – no concerns or decisions about what to wear. I have evolved a similar plan for work clothes – I pair black, navy or beige slacks with 5 different color turtle neck shirts in the winter or 5 short sleeve cotton shirts in the summer. I love it and no one notices ( or at least tells me about it!) With 5 I don’t repeat for a week. My daughters wear uniforms. They like them, too. Navy bottoms and a choice of five different colors of polo shirts with the school logo on them. Great post Colleen’s husband! It really is true that we wear 20% of wardrobe 80% of the time. I used to wear a lot of suits to work, but now I’m a mix and match separates girl and rarely ever wear the suits. Yet I still have them. I need to just let the suits go and then tackle and streamline the overload of separates in the blacks, browns, and navy categories. Oh and @Cindy – what is it with men and their t-shirts??? I haven’t counted my husband’s collection, but I think he could give your husband’s collection a run for the money. It is too late to do so tonight, but I will have to tackle my closet again in the morning to relinquish more clothes after reading this inspiring post. Thanks, Colleen’s husband, and hope you two are having a great time! Cannot do it!!! Not yet! Not until I have to! I have to confess that I LOVE clothes and fashion!!! I can declutter almost everything I have but not my dishes and baking and cooking items (I love cooking, baking and entertaining), or my clothing. I have introduced simplicity into my life and I consider myself thrifty and ecologically-minded and I “try” to apply the rule of one in/one out rule. I regularly pull out all of my clothing and decide what I wear regularly and what I wear infrequently. I can easily purge those items which I no longer like and which aren’t classic or beautiful. I’ve travelled with only a carry-on, on several extended- stay vacations with a limited wardrobe, and I have enjoyed the freedom of fewer things to choose from and to carry. I wore uniforms for 12 years of school, three years of nurses training and another 18 full-time years of nursing before my career changed into non-uniformed nursing positions.During all those uniformed years, I had perhaps 6-7 outfits which weren’t uniforms! In 1995 I experienced a clinical depression and gained 40 pounds in the six months I was prescribed antidepressants. I told my family doctor that if he thought I was depressed in March 1995 (I was finishing my Masters in Adult Education), I was going to be depressed for life if I didn’t stop gaining weight .I stopped taking the antidepressants after the six months but the weight remained.For the next 10 years I kept the weight on, despite regular exercise and many efforts to reduce ,and I had difficulty buying clothes which fit and looked good, and weren’t too expensive. In 2005 I retired early ( 57 years old) from a full time nursing career of 36 years, and spent the next full year getting back to my ideal weight…40 pounds. During that year, my friend and I frequented the second hand stores regularly, as she too was losing weight. We had lots of fun and we acquired a fairly expansive wardrobe…and we bought classic and quality items which we took to a consignment store when they no longer fit. Win-win….and the beginnings of one thing in, one thing out. Move forward to now, 2014: I still have some of those items I purchased when I hit my lowest weight eight years ago, and I continue shopping second-hand stores for “label” items and still frequent consignment stores where I regularly turn in my not-so-great clothes.But I also enjoy retail-shopping full price, and I don’t “have” to decide” which” pair of pants to buy…I can buy both. I have a closet full of clothes I love, and I have a hubby who also sees my clothing as a measure of “my” success. My success… hmmmmm..I am not greedy, I still question everything I buy (second hand or retail), and I often return items which I consider frivolous. Clothing shopping is my retail-therapy, I like to think. I am happy to say that life is great, I have maintained my weight loss, and my retired- radiologist hubby (the lad I started dating in 1989) has always been there for me, during the good, the bad and the ugly! Hi Elaine, if you love your fashions and your bake ware then so be it. They aren’t clutter. It is only a problem when a person has this attitude to everything in the house. I was however pleased to hear that much of what you buy is secondhand. I would not be so keen to approve if you were constantly buying new. Not because of the clutter issue but because of the environmental issue.